Locate the town of Matsumoto, near the Expressway that runs north to Nagano. Go west from here on Hwy. 158. The road will enter a narrow valley, then follow some (narrow) water reservoirs, first one on your right hand side, next one on your left hand side. Shortly after leaving this second reservoir, one should locate (pay) parking, as the village at the base of Hotaka, named Kamikochi, is served by shuttle bus from these parking areas. We parked at location N36.16953, E137.64835, on the left hand side of the road. There is a bus stop right next to this parking. The elevation is near 1000 meter. Note that one is expected to buy the bus ticket from a ticket machine at the stop. The bus will carry you further up the valley, then fork right into a tunnel after about 7 kilometer. The bus will stop at the local bus-station in Kamikochi. There are several options for lodging here, reservations should be made in advance. There is a big pedestrian bridge crossing the river, sort of in the middle of this tourist town. This location is N36.24905, E137.63753, elevation 1490 meter, this is a good reference as a trailhead. From the big pedestrian bridge across the river in the central part of the village, location N36.24905, E137.63753, elevation slightly below 1500 meter, follow a big trail that runs along the river (upstream), you have the river off on your right side. The trail is partly boardwalk, and you cross a couple of small streams on wooden bridges. Shortly, this trail hits the (dirt) road, continue directly across. The trail is now somewhat smaller, but still nice, rocks are often placed like steps etc. Gradually, this trail will climb, then more sustained uphill, until you reach a mountain hut at location N36.27649, E137.64737, elevation about 2170 meter. From the hut, the route heads uphill, a bit right as seen when facing uphill. Cross the nearby rocks, then zig-zag up an open slope that gets steeper as you get higher. Traverse a bit right, then climb tothe top of the spur, there are 4 ladders to help out, the first one being the longest. Follow the ridge a bit until it ends in the general mountain slope. The trail is well marked as you scramble a few sections, mostly YDS class 2 and 2+. Note the rocky section that has been improved by wooden frames, then up some easy angle rock slabs, partly protected by a chain (that one normally would not need to touch). Pay attention, just near the top of an easy scramble, there is a key trail fork, however, the sign is a bit out of view to the climbers left, hidden by a small local feature. While one trail continues uphill to a lower summit, the route traverses left here in order to reach a col on the main crest. Follow the clearly marked trail mostly horizontally as it turns several local corners before hitting a small col on the main ridge where you may look down on the opposite side for the first time. From here to the summit, the route basically follows the ridge, mostly on its left side to avoid/bypass local humps. A fine view down on the far side in a few places. There is a pretty large mountain hut visible in the basin/valley below. The route makes a very brief visit to the (climbers) right hand side of the ridge, turns back and enters the top ridge, the final, short stretch to the summit being an easy walk. The summit has a massive cairn with a small (Japanese) temple on top, then a cylindrical pillar with an official plaque on top. We stayed in Alpen hotel in Kamikochi the night before the climb. We decided that this climb was likely to be long enough without having to travel several hours in the morning in order to reach Kamikochi. Also, the weatherforecast called for pretty bad weather in the afternoon, another incentive to get an early start. We started hiking at 0730, following a nice trail that got us up to the mountain hut sitting near the top of the local valley, at 0900. The weather was still ok and after a 15 minute break, we continued uphill. The trail was easy, quite a few people coming downhill, most likley, many of them started from different huts located across the main crest of the mountain. A couple of rain showers hit us when we were essentially near the last small col on the ridge, about 15 minutes short of the summit. Shortly, at 1130 me arrived at the summit with its rather impressive summit cairn. 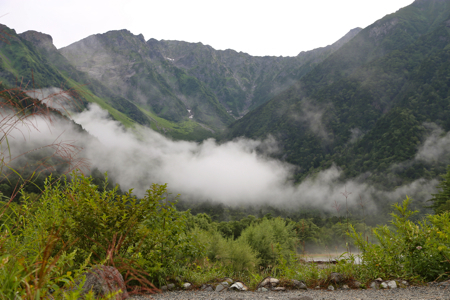 The weather cleared a bit and we could see all the way back down to Kamikochi. We left at 1150 and had a mostly dry hike back down the ridge with views also down to the hut located on the opposite side of the main crest. The weather held quite well as we descended the steeper parts including the ladders. Just before the mountain hut, we again had rain and this time more persistent. We arrived there at 1420, made a 10 minute stop before descending back down to the village in one hour. Thus, a total trip time of 8 hours as we hustled to the bus station and immediately got a bus departure for our car park. Overall, a very successful climb in absolutely acceptable weather. We drove back into the valley and found accommodation in a small, private hostel located in the outskirts of the town called Ina. Our next goal would be Ontake before moving further west.